Is play count watching a step too far? 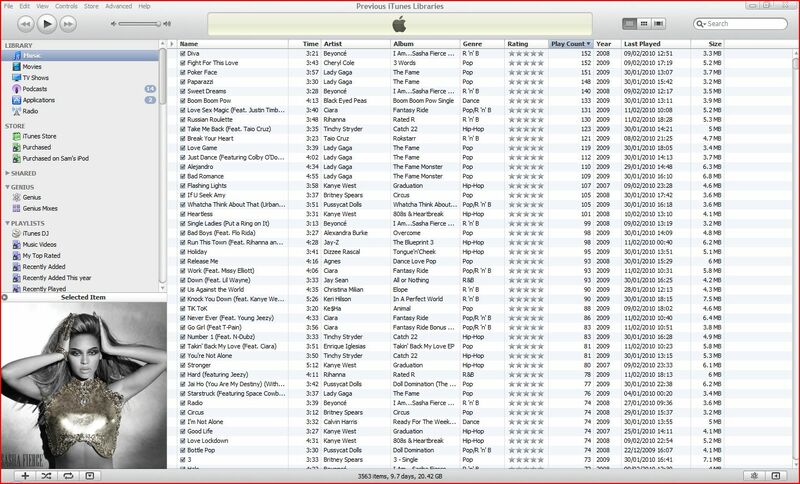 Since owning an iPod, and using iTunes instead of Windows Media Player, one feature has become a guilty habit. Keeping an eye on the play counts of songs is a great way to see which albums you are getting your money’s worth from, but when you start to add to play count when you see a music video on a music channel, or hear a song in a shop, something’s wrong. I was so addicted that when I would buy an album after owning a single, I would skip to the end of the song over and over again to get the play counts equal. It sounds ludicrous, but it became a compulsion for me to have a clean and fully realised set of play counts for my music library. Tracking the top 5 was important, and while I’ve lost some of the compulsion to make everything right, I still keep an eye on who is on top. Right now Beyoncé is once again joint top, though not with Lady Gaga as it has been for a while, but Cheryl Cole (A fact I do feel ashamed of). Taking a look down the whole list is the perfect indication of my music tastes. With UK acts like Tinchy Stryder and Taio Cruz up there with Rihanna and Kanye West, and a Christina Milian track thrown in for good measure, it can be refreshing to look at the hard facts as to what you have been listening to. How Diva and Sweet Dreams are positioned higher than Single Ladies is interesting for instance, or how my personal favourite record of the decade (I’ll leave that for another post) hasn’t even passed the 30 listens mark. For those who’d rather not struggle to see the list in the picture above, the top 10 can be found after the jump. Previous post ← My Mum likes Jay-Z?